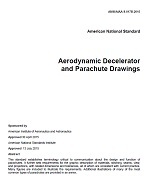 standard by American Institute of Aeronautics and Astronautics, 2018.
standard by American Institute of Aeronautics and Astronautics, 11/07/2016. standard by American Institute of Aeronautics and Astronautics, 10/17/2016. standard by American Institute of Aeronautics and Astronautics, 09/20/2016. standard by American Institute of Aeronautics and Astronautics, 06/03/2016. standard by American Institute of Aeronautics and Astronautics, 10/14/2015. standard by American Institute of Aeronautics and Astronautics, 07/24/2015. standard by American Institute of Aeronautics and Astronautics, 04/30/2015. standard by American Institute of Aeronautics and Astronautics, 02/01/2015.